What a well-written sequel. If you read and enjoyed Time Between Us, then Time After Time is a must-read for sure. It's a great continuation, and yet wraps up the story nicely. 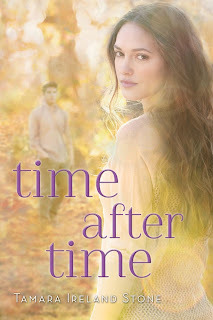 I do think I like Time Between Us a little more, but I'm still blown away by what a wonderful sequel this was. The plot and characters are what really make me love this book. Both Bennett and Anna are fantastic characters, both on their own and as a couple. It's hard for an author to pull this off, but Stone does it perfectly. There's a good mixture of both romance and character development, which made me very happy. :) However, I do have to say that, while I loved reading from Bennett's POV, it did seem a little unrealistic at times. He's always such a nice guy, which I LOVED, but at the same time it didn't seem exactly realistic. Oh, boy. The plot pretty much left me incoherent. How does Stone write stories that are so heartbreaking? Seriously, they just hit you right in the heart and leave you in a sad emotional state. Bennett is trying to use his ability to travel in time to help save others in this story, and...well...there are consequences, let's just leave it at that. The storyline definitely kept me turning the pages. And the romance. *swoons* The love story between Bennett and Anna is one of my favorites! I love how there's no desperate, dramatic, "If I can't be with you I'm going to die!" moments. Instead, their romance is refreshingly real. They both do everything in their power to be together, but they also realize they have a life aside from each other. Even though they're very much in love, they're still sensible. So yay for a sweet, realistic romance! * Thanks to Netgalley for sending me a free copy in exchange for an honest review!